On June 29, I walked by a poster session at the Natrional Education Computing Conference titled Data Collection Forms on PDAs for Student Field and Laboratory Experiences by Laura Guertin from Penn State Delaware County. 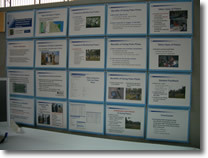 Unfortunately, Laura was not present at the poster session, but I did snap some photos of her informative display. The part that intrigued me the most was this photo of a handheld in a plastic bag with the caption, "Palms can be used in all weather." I've never thought about using handhelds in rain or snow, but apparently a handheld's screen can sense stylus movement through the thin plastic. In fact, as I was delayed in the Philadelphia airport, I hung out with Lisa Olinger, a palmOne™ expert. She added that handhelds can be vacuum sealed like food. She even shared with me that if you leave some air in the bag, you can safely take the handheld rafting. If your handheld goes overboard, it will float! "I appreciate not having to type in all that data." "I hope we use Palms for more projects/classes." "I went out and bought one for myself." "Using a Palm is not 'rocket science.'" Although Laura's students are education majors in college, these future teachers will hopefully use data collection with their future students. As was noted in my previous blog entry, student learning has been shown to increase 3%-19% by using handhelds to collect data.